From its lavish interior décor to its varied engine and model lineup, the 2017 Audi A6 equally delights both its driver and passengers. The 2017 audi a6 electric vehicle qualifies for a federal tax credit of up to $7,500, effectively reducing the net base price. Perhaps one of Audi’s most underappreciated sedans, the 2017 Audi A6 is really one of the better choices in the 4-door luxury-performance arena. Although the diesel model is dropped this year, Audi’s turbocharged 4- and supercharged 6-cylinder gasoline engines deliver impressive performance and decent fuel economy. The midsize Audi A6 offers a more comfortable rear seat than the smaller A4 without the ponderous size, weight and price of the larger A8. The BMW 5 Series and Cadillac CTS may best the A6 in the turns, but when it comes to combining a comfortable ride, dynamic handling and a luxurious interior, the A6 is more opulent than a Lexus GS, handles better than a Lincoln MKZ and is more upscale than a Hyundai Genesis. If you’re looking for a luxury car that knows what the word “luxury” should mean, Audi’s A6 sedan for 2017 will likely meet your criteria. The new Competition trim delivers a sportier ride, while the V8-powered S6 is every bit the equal of the BMW M and Mercedes-Benz AMG trims. Barring the S6, the front-wheel-drive 2017 Audi A6 sedan still isn’t as sharply tuned as rear-drive competitors such as the BMW 5 Series, Cadillac CTS and Infiniti Q70. Some may find the A6’s styling a bit demure, while others will lament the lack of a V8 option on luxury trims. For 2017, Audi’s A6 luxury-performance series loses its diesel-engine option, but gains a new trim: the 3.0T Competition. Outfitted with a 340-horsepower supercharged V6 and a quattro sport differential, this new trim splits the difference between the luxurious 3.0 and the performance-oriented S6. In our time with the 2017 Audi A6 3.0T, we found the supercharged V6 had no issues when it came to acceleration, passing power or smoothness of operation. The A6’s 8-speed automatic transmission performed flawlessly, showing no sign of the lag and hunting we’ve experienced with other manufacturers’ 8- and 9-speed transmissions. The A6’s brake pedal is easily modulated, a helpful feature for those dealing with constant stop-and-go traffic. Although the EPA rates this engine at 21 mpg city/29 highway, we found the temptation to constantly hammer the throttle produced significantly lower figures. We imagine if you practice a more genteel driving style, however, the EPA’s figures are likely on target. 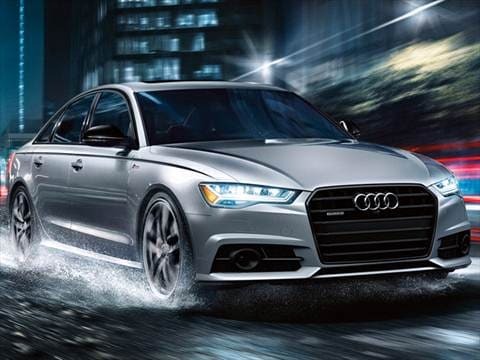 Despite its midsize designation, the 2017 Audi A6 feels smaller and more nimble than one would expect, nearly mimicking the performance of the Audi A4 in the turns, a feat made possible thanks to the standard quattro all-wheel-drive system. The 2017 Audi A6 sedan’s newest trim splits the difference between the hard-riding S6 and the more luxurious 3.0T. It’s a nice compromise for those seeking a comfortable daily driver with a bit more athleticism than the base A6. Luxury should be more than just electronic gimmicks and shiny add-ons. Audi’s A6 luxury sedan for 2017 clearly shows a level of skill and commitment to design that is often copied by the competition. But why settle for a copy when you can have the original? We’ve already waxed poetic about how much we enjoy the Audi A6’s interior, but we still have more to point out. Along with the supple leather and intricate patterns, the 2017 A6 sedan includes Audi’s industry-leading MMI infotainment and navigational system that continues to astound with some help from Google Maps and Audi’s smartphone interface. Then there’s the available Beaufort wood trim with aluminum accents, which does wonders for your sense of sight. The rear seat is most accommodating for tall adults and, thanks to the low window beltline, offers excellent outward visibility. The A6’s exterior features some bold elements, such as the recently upgraded headlights, grille, front bumper and LED taillights, but overall the shape and styling remain typically Audi conservative. From behind, the taillights boast a sleek profile and are easy to pick out whenever you’re behind one, day or night. Climbing up the trim ladder brings things like more aggressive side-skirts and badging to let your neighbors know you want to go fast. The available Black Optic package adds 20-inch 5-arm star-design wheels with a polished-black finish. All of the usual suspects you’ve come to expect in a luxury-midsize sedan are found on the standard-equipment list. This includes leather seats (heated up front), Bluetooth phone and audio capability, automatic headlights, 18-inch 10-spoke alloy wheels, 10-speaker audio with CD player, tri-zone automatic climate control, a power sunroof and driver’s seat power lumbar and memory. BMW and Mercedes-Benz require you to check an extra box if you want leather seats in their offerings. Audi’s Parking Systems Plus with rearview camera is new for 2017, as is the S-Line exterior design treatment. Audi’s optional-equipment list can get a little overwhelming (and expensive) quickly but you’ll get what you pay for in terms of comfort and refinement. Things like the available MMI infotainment and navigational system include smartphone integration for Apple CarPlay and Android Auto, while the Driver Assist package adds adaptive cruise control, active lane assist, Audi pre-sense plus, auto high beams and a top-view camera system with distance sensors. A head-up display projects relevant driving information, while Night Vision Assist can detect people or animals up to 1,000 feet ahead. The Competition trim can be equipped with S sport seats. Standard in the base 2017 Audi A6 2.0T is a 2.0-liter turbocharged inline-4 cylinder good for 252 horsepower. The A6 3.0T Competition gets a 7-horsepower bump over the standard 3.0T 333-horsepower engine, while the S6’s V8 is rated at 450 horsepower. In the front-wheel-drive (FWD) 2.0-liter A6, a 7-speed S tronic dual-clutch automatic transmission administers gear changes, while the available 8-speed Tiptronic automatic transmission is paired with the 2.0-liter's all-wheel-drive (AWD) configuration. That same 8-speed automatic serves with the 3.0-liter supercharged V6. The 4.0-liter V8 is mated to the 7-speed S tronic. The Manufacturer’s Suggested Retail Price (MSRP) is just over $48,500 for a 2017 Audi A6 with 2.0-liter turbocharged 4-cylinder engine and front-wheel drive. The 3.0T starts around $60,000, while the Competition trim bumps the price closer to $69,000. A top-flight S6 model will set you back around $72,000, but be ready to pay more than that to get the bells and whistles you want. Competing with the new A6 in the midsize-luxury-sedan arena, the BMW 5 Series and Mercedes-Benz E-Class start in the low-to-mid-$50,000 range. Other alternatives include the Acura RLX (starting at around $52,000), Hyundai Genesis ($40,000), and the Infiniti Q70 (around $51,000). Check out KBB.com's Fair Purchase Price for a look at what A6 buyers in your neighborhood are paying for their new Audis. In the resale market, A6s have historically held their own against their German rivals, while giving up a little ground to Japanese luxury leaders like Lexus. Solid, dependable, good looking, excellent build, comfortable. A full-size car that averages 39 mpg.